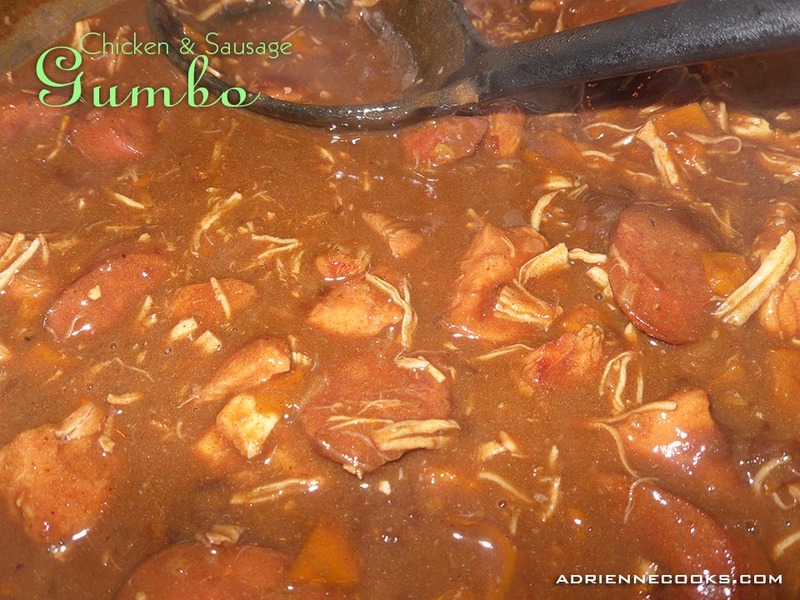 Chicken and Sausage Gumbo, N’awlins in a bowl! 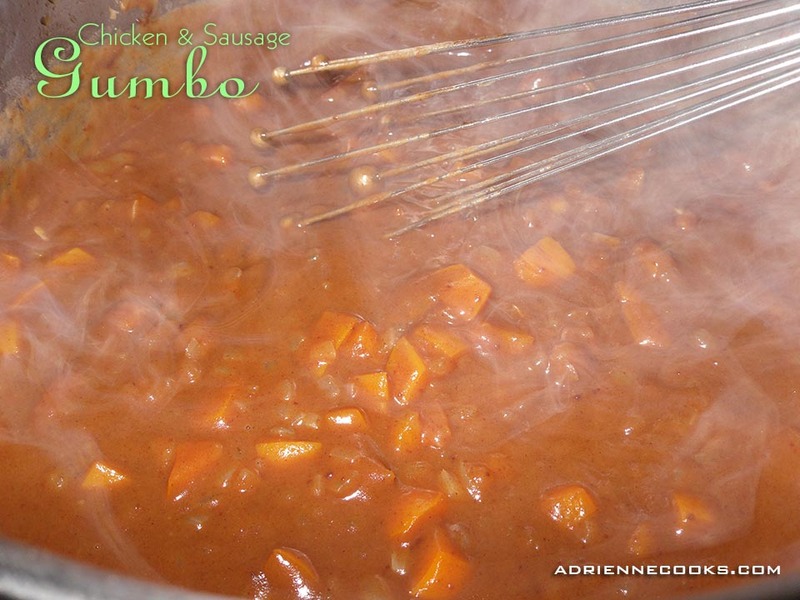 Chicken and sausage gumbo… mmm… makes me want to hop on a train to NOLA. In fact, last time we visited that’s all my husband ate! Needless to say, this is one of his favorite meals I fix at home. It takes a little prep time and a lot of simmer time but it is so worth it! In the South, gumbo is almost like holiday dressing – infinite ways to make it and everyone has the “right” way. 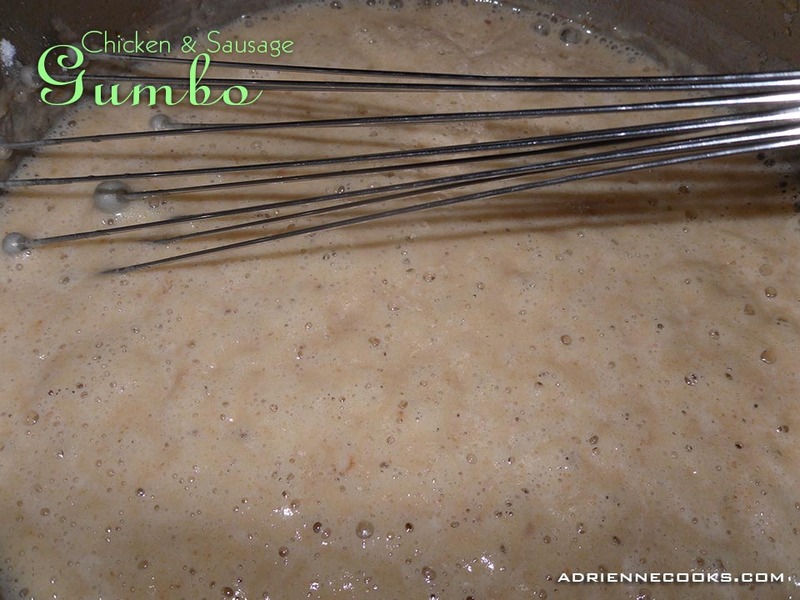 Just ask someone about their favorite gumbo recipe, you’ll see! This recipe uses sausage and chicken. 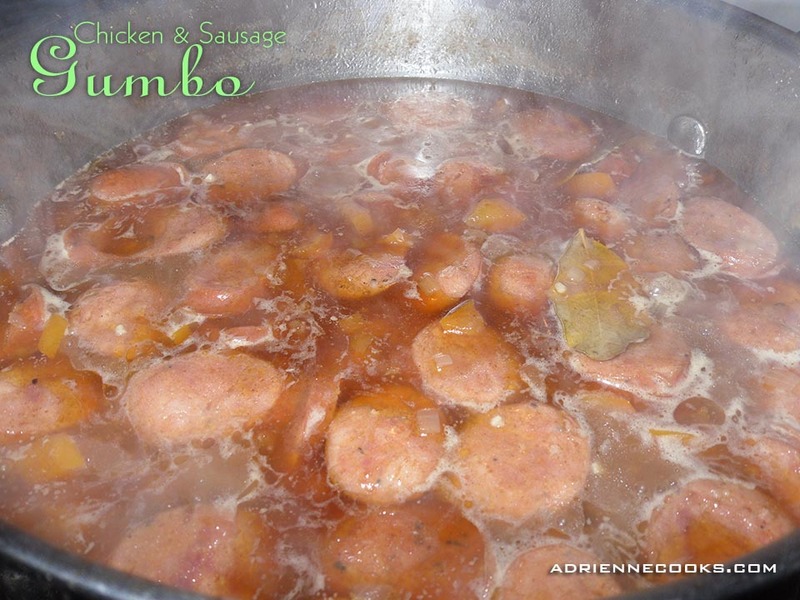 Again, there are so many gumbo recipes with varied ingredients but these two are easy to get an any mega mart in any part of the country so we’ll start here. Cut up your chicken and sausage into nice bit size pieces. Cut the sausage on a bias so it’s a bigger bite but a thin slice, that way you get more sausage in every bite. The chicken should be about half-inch cubes. Get out your gumbo pot. 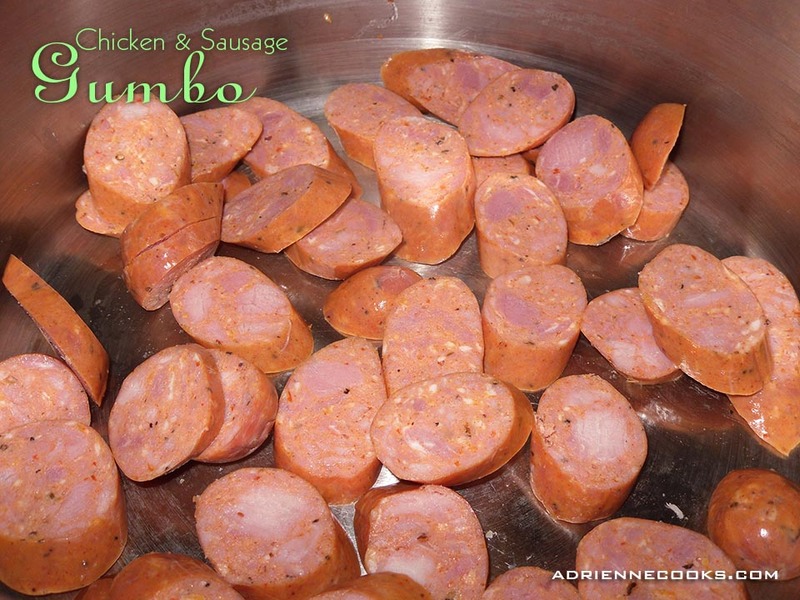 Don’t have a gumbo pot? Get out your largest Dutch oven and heat to medium high. Cook sausage until browned and remove from pot. Make sure to use a slotted spoon to reserve as much Andouille grease as possible. Treat the chicken the same way. It only needs to get white on the outside with a little brown – it won’t be “done” – that is, cooked through. It will continue cooking in the simmer stage so don’t worry. Once chicken is removed, add enough vegetable oil or duck fat or bacon fat to get up to ½ cup in your Dutch oven. Add your AP flour and cook over medium, stirring constantly until you get a chocolate roux. What is a chocolate roux? Well, you want the flour paste you’ve made to turn the color of chocolate. This takes a minute, like 20… so don’t be fooled. Stir in your veggies. Yes, they will sizzle. If you cut them small enough they’ll cook in roughly 5 minutes. The roux will start to seize up and that’s ok. After the veggies are softened add you chicken stock. Then add your seasonings and garlic. Add the meat back in and bring to a boil. Reduce heat to a simmer and let cook, covered for 2 hours. 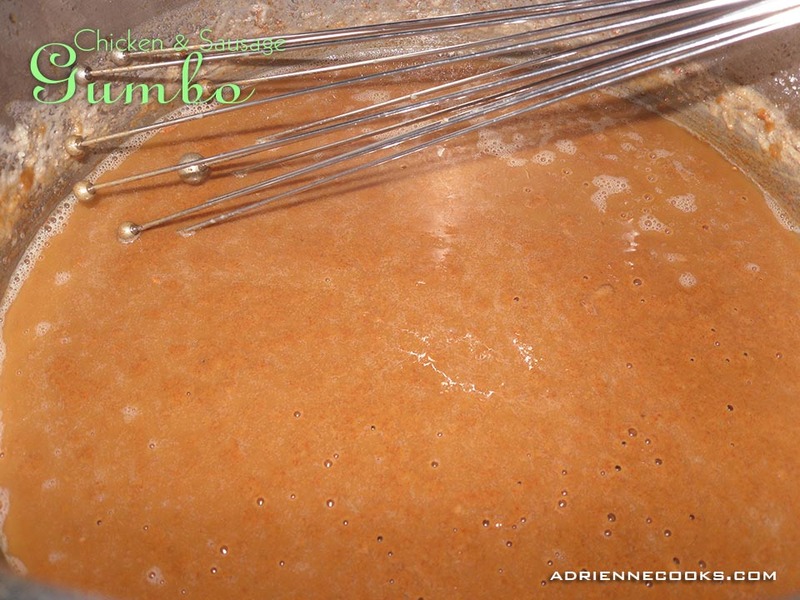 Simmer for an additional 30 minutes uncovered if you’d like a thicker gumbo (don’t forget to remove your bay leaves!) or serve as is over rice. Either way you have a mighty fine gumbo! 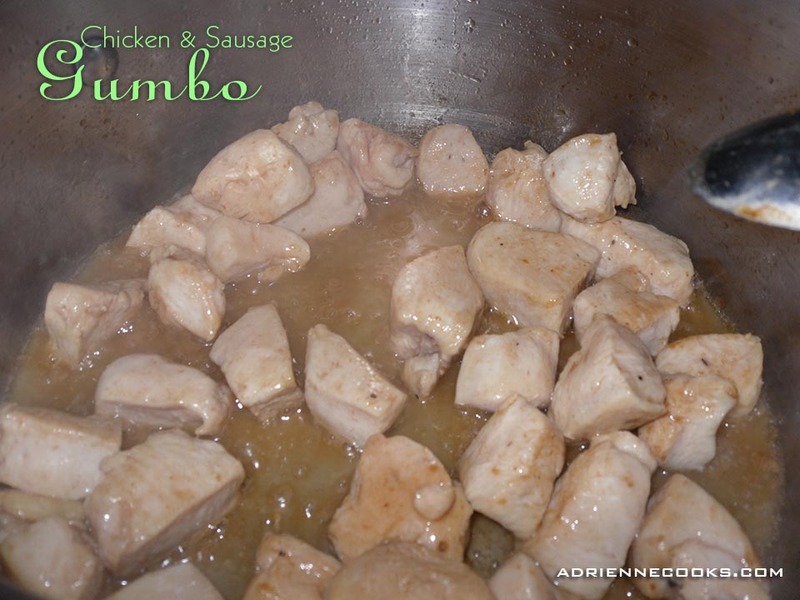 Finally a Gumbo recipe without seafood! I cannot wait to try it. I’ll probably tweet it a little. Yum!